Castillo de Belmonte is a medieval castle located on the hill of San Cristobal, just outside the village of Belmonte. It was declared a historic monument within the National Artistic Treasury by a decree of 3 June 1931 and is now a Bien de Interes Cultural. 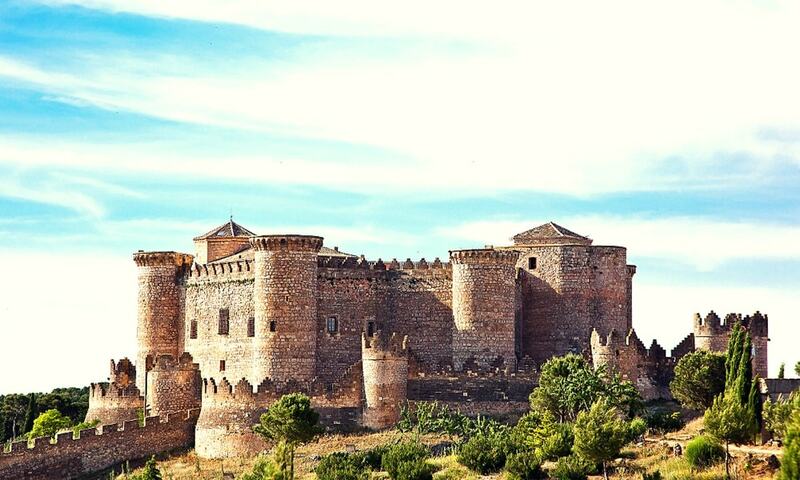 The castle was built in the second half of the 15th century by order of Don Juan Pacheco, first Marquis de Villena, during a time of convulsions and infighting in the Kingdom of Castille. It was begun in 1456 but remained incomplete on the death of Pacheco. His son Diego Lopez de Pacheco partly continued his father's work of his father, but mostly neglected the fortress. The fortress was practically abandoned between the 17th and 18th centuries and was more or less ruinous by the early 19th century. The heiress of the house of Villena, Eugenia de Guzman, better known as Empress Eugenia de Montijo and her architect Alejandro Sureda began a restoration project in 1857. The castle was then occupied as a French Dominican monastery for several year. After the Dominicans left, the empress' great-nephew the Duke of Penaranda, continued the restoration and even lived within the castle. It was abandoned and began to deteriorate again, before being made a cultural monument in 1931. Belmonte Castle opened its doors for visitors in July 2010 and offers a cultural visit along the history of the monument from the fifteenth century to the present.